Summer is on it's way, and whether you like basking in the sun on a sandy beach, or rather prefer sitting in the shade of a parasol beside a pool, with one colorful drink in each hand, a stylish bathing suit might soon come in handy. So here are a few I wouldn't mind dressing up in myself! The Bow Bikini from What Katie Did. The A Lace To Call Your Own bathing suit from ModCloth. The Moonlit Swimsuit top and bottom, ModCloth. The Lacy Days one piece, ModCloth. The super sweet two piece Cutie Pie Picnic, ModCloth. ...and it also exists as a two piece! 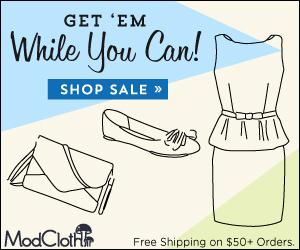 Both from ModCloth. Same style as above, but in another color. This one is called the Snack Bar Beauty, ModCloth. For the cherry lovers there is also this one from Daisy Dapper. If you prefer getting a tan but with no tan lines, I recommend you go to a nudist beach though! Never been to one myself, but heard it can be quite fun... But don't forget sunscreen!!! PS. Since many of the bathing suits in this post come from ModCloth, I might as well mention that right now ModCloth is giving away free grab bags with stuff for 50 USD to everyone who places an order over 125 USD! The supplies for these grab bags are limited though, so get them while they last! Click on the banner below to get there quickly! This has put me into such a good mood for Summer Miss Meadows even though we're in the same position in Ireland that Doll is in, still beautiful items no matter what though! Screw You Guys, I'm Going To Paris!